Glass With a Twist is an online store that offers custom engraved restaurant-quality glassware, made to your specifications. Personalize your choice of beer mugs, champagne flutes, wine glasses, cocktail glasses, coffee mugs and more using one of the provided template designs - or create your own design! The engraving is permanent and fully customizable, plus there are no setup charges or minimum quantities. Order a set for a gift, or just one for yourself! I think a set of personalized champagne flutes would make a great bridal shower or wedding gift, engraved with the bride and groom's names and their wedding date. You can even engrave the names and dates on the base of the glass. These would also make fun party favors, like margarita glasses for Cinco De Mayo or martini glasses for a bachelorette party. 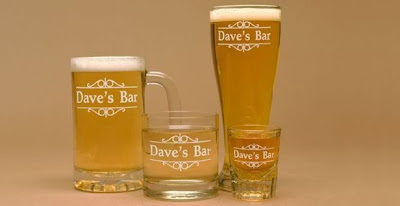 Or, get dad a set of custom beer mugs for his bar for Father's Day! Enter below to win a Set of 4 Custom Engraved Glasses of Your Choice! Choose from beer, wine, champagne, shot, cocktail, martini glasses and coffee mugs. 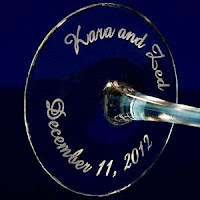 Personalize each glass separately, or all with the same engraving! Disclaimer: This giveaway is sponsored by Glass With a Twist. Winner will be contacted by email for shipping & prize information. Prizes will be sent directly from the company to the winner. US Only. I like the rocks glasses! I think I'd get the rocks cocktail glasses for my husband! I could really use custom shot or beer glasses! They would be awesome for parties! I would get some stemless wine glasses. I would get the beer glasses for my husband!!!! He would love them. One of the things I would get would be the Mommy's Juice / Daddy's Juice wine glasses. Too cute! I WOULD GET THESE >margarita glasses. I would get the beer mug ! These engraved glasses are also perfect wedding and holiday gift for guest or special someone, you can put any design on glass but make sure they looks cute and memorable.